Social networks can make a big difference on the popularity of a blog. Sites that communicate better and understand social media are usually the most popular. A move towards this goal would be to find a way to encourage your visitors to share your content on the networks they are most active on. Go ahead and download the demo files and continue with step one of this tut. #share-label - this has the "share the love" image as a background. It is also floated to the left and thus positioned right next to the #stage div. The code above is all you need to add to your page (in addition to the js and css files), so you can show the animated bar below your articles. Each button has a generic btn class and an individual one (digg, tweetmeme, etc). This makes it possible to gather the common rules shared by the buttons in a single class and make it easier to customize at a later time. Now lets see how these elements are styled. I've divided the CSS code into two parts. Maybe at this stage you are wondering how the actual buttons are animated in a circular movement on the page. A major part of the technique takes place inside the #stage CSS class above. The stage itself is relatively positioned, which enables the buttons (which have absolute positioning assigned by jQuery below, and are direct descendants) to be positioned accordingly. This means that setting top and left to zero on the buttons, positions them in the top-left corner of the stage. You'll see the rest of the technique in step 3. In the second part of the style sheet, we assign individual rules to each button which define a unique background image with the reflection. After this we customize the facebook button, so that its styling matches the rest of the buttons. With this we can continue with step 3. The main idea here, is that we use setInterval to set up a function to be run every 40 milliseconds. This means that it is run 25 times a second, or if you compare it with a movie screen, this is 25 frames per second. In other words more than enough to display a smooth animation (providing that the rendering speed of the browser is fast enough, and that there are no other scripts interfering). As this is not a computation-heavy animation, it runs pretty smoothly on all browser versions (even as old as IE6). However, the smoothest animation I've observed is in Safari and Chrome (it would run nicely in Firefox too, providing that you don't have a lot of add-ons or opened tabs). You can see throughout the code above, that I tend to assign the results of jQuery selectors or other functions to variables. This is done to improve the speed of the script, otherwise all those functions and methods would be calculated on every frame (for a total of 25 times per second) which would ultimately bring down the performance and smoothness of the animation. With this our animated sharing bar is complete! 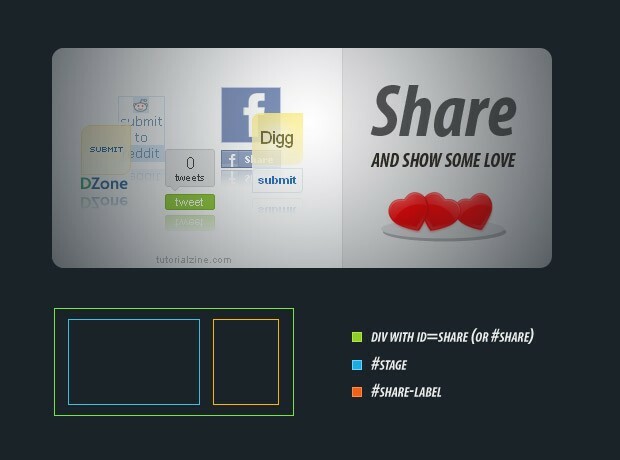 In this tutorial, we created an animated social sharing bar which encourages visitors to share articles on a number of social networks with an eye-catching animation. To include new services, in addition to the five currently active, you just have to include a new btn element in the stage div with an appropriate script that would generate the button. What do you think? How would you improve this script? Take that flash, we have no use for you anymore. This is really awesome. Almighty jQuery! Thanks for sharing this great tutorial. Really cool tutorial. I personally wouldn't use this for my site, but it just shows us that the possibilities are limitless with jquery. Thanks for pushing the limit and coming up with one incredible tutorial after another. That's really nice. Just wanted to drop by and say thanks - I really enjoy your tutorials. =] Keep up the good work. Amazing, and as said, the beginning of the end for flash on websites, lol. Not sure how practical or how much people would use it, but its great to see something like this in use, and it could be adapted for things like banners etc. Very nice, but why XHMTL? This can be done just with HTML (3.2, 4.01, 5). I do not see any reasons to use XHTML (with this and other scripts, and… at all). BTW: so why "demo.html" and not "demo.xht"? Thank you for this great Tut! I think a non-animated sharing bar is much more user friendly: it doesn't distract so much and it goes quicker to ckick on a static icon. Users should easily find the bar, but it shouldn't disturb the reading process. Thanks for the great comments folks! Really appreciate it! XHTML is the standard for contemporary web development, and as this is a tutorial, it is best that the readers are presented with it. However, you are free to modify the demo and rewrite it in any spec you'd like. The aim of the tutorial is to teach people and show them what is possible to be done with pure JS alone. The example that is build is a proof of concept that complements the tut, rather than a standalone script. So as long as the sharing bar draws interest to the matter of JS animations, it is a job done. Not as user friendly as a static version, but still a great effort in demonstrating another reason for not needing Flash. Excellent post. How can i increase the radius of the circle. I want the items to have more distance between them.